A few years ago, someone stenciled the sidewalks near my Montana home with footprint-sized silhouettes of trout. The symbols appeared at street corners near the openings of storm drains. The message "Dump no waste, drains to river" bracketed each fish symbol. The habitat of primary concern to the painters was the Gallatin River, a near-pristine trout stream that tumbles north out of Yellowstone National Park to form one of the three headwaters of the Missouri River. Lawn chemicals, road oil, industrial fluids, and sewage discharges from Bozeman and other towns in the Gallatin Valley, along with manure and fertilizer from hay, wheat, and potato fields, all seep into the passing river and its feeder streams. The Gallatin is only the first stop, however. Our sidewalks might just as legitimately bear the silhouette of a red snapper or brown shrimp, I've recently come to recognize. Whatever contaminants wash off the lawns here or nearby crop fields into the Gallatin can eventually travel more than 3,700 river miles down the Missouri into the Mississippi and end up flushing into the northern Gulf of Mexico. River watershed (all the land that contributes water to the river) sprawls across more than 40 percent of the land in the lower 48 states, including more than half the country's farmland. It receives wastes discharged from sewage plants and other specific effluent pipes or "point sources" of pollution as well as millions of dispersed or "nonpoint sources," such as cornfields, cattle pens, and golf courses. All this material, but particularly the nitrates (NO3) leached from fertilized cornfields in the upper Midwest, combines to degrade water quality and habitat in rivers across the watershed. Far downstream, out of sight and mind of those of us who generate it, 1.6 million tons of that nitrogen spill into the coastal waters of the gulf each year. That triggers a complex cascade of events that starts when the nitrogen— an essential plant nutrient—fertilizes excessive blooms of small floating algae or phytoplankton. The algal blooms in turn spur a population explosion among microscopic grazing animals known as zooplankton. When this plankton productivity is too great for fish and the rest of the food chain to use—a state called eutrophication—uneaten organic matter sinks to the seafloor to rot, prompting a population boom among decomposer microbes. The frenzy of heavy breathing by these microbes, in turn, uses up dissolved oxygen. Oxygen in the air is readily soluble in water, and surface water in contact with air is rich in dissolved oxygen that most aquatic organisms require to power their metabolism. In seasons when there is little mixing between the surface and deeper waters and biological activity is high, however, the oxygen in bottom waters becomes depleted. The result is a recurring summer "dead zone," a vast area of oxygen-starved, or hypoxic, bottom waters starting near the mouth of the Mississippi and Atchafalaya rivers and reaching far into the gulf that drives fish, shrimp, and other mobile creatures from an area larger than Lake Ontario—an area that reached a record 8,000 square miles in July 2001.1 Clams, oysters, sea stars, and many other benthic creatures unable to travel far or fast enough to escape simply suffocate. Troubling as these dead zones are, the problems caused by excess nutrients would be much worse without the natural "life support services" provided by rooted plants and especially by bacteria in the mud of waterways, wetlands, and floodplain forests throughout the world's watersheds. Thanks largely to the natural cleansing services of these organisms, for example, only one-fourth of the Mississippi River's increasing burden of waste nitrogen actually reaches coastal waters.4 Clearly, however, in the Mississippi basin and many other watersheds, the scale of human activities has begun to overwhelm the capacity of sediment communities to use, recycle, or eliminate reactive (biologically usable) nitrogen. 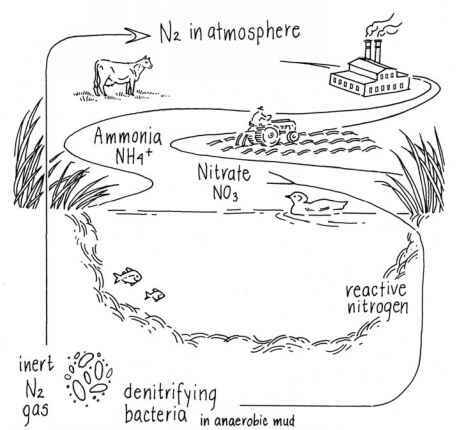 Wetland sediments host vast populations of denitrifying bacteria that can inactivate and release to the atmosphere much of the excess nitrogen generated by our farms, livestock operations, factories, and automobiles. What humans haven't increased is nature's capacity to turn that nitrogen back to the atmosphere in its inert (biologically unusable) form, a recycling job that a rich array of microbes handle through a process called "denitrification." In fact, we've often severely reduced denitrification services in regions such as the Mississippi River basin, where we need them most, by destroying wetlands that serve as home to vast concentrations of denitrifying microbes. Admittedly, that extra nitrogen we generate in the form of fertilizer and through burning coal and oil makes it possible to feed and fuel our burgeoning populations, but it also helps drive some of our most severe environmental problems, from acid rain, global warming, ozone depletion, and loss of plant diversity to polluted water supplies and coastal dead zones.6 The attempt to redress some of this damage by restoring prime habitat for denitrifying microbes in the Mississippi basin is the topic of this chapter. The Olentangy River lies about 1,500 miles east of the Gallatin, yet its waters end up in the same place. The river flows through Columbus, Ohio, on its way to the Ohio River, then the Mississippi, and on to the Gulf of Mexico. On a sunny late afternoon in May, I drive north along the river through the Ohio State University campus and arrive at the Olentangy River Wetland Research Park just as the staff is leaving for the day. When I ask for the director, William J. Mitsch, his assistant sends me down a paved path toward a two-story pavilion overlooking a series of manmade marshes. Mitsch, an unabashed evangelist for the virtues of wetlands, has just set off on a tour of the 30-acre site with two dozen local science teachers in tow. I catch up and fall in behind the group just as Mitsch is pointing out a sign on the ramp leading up to the pavilion. It touts the three great values of wetlands: flood control, water purification, and wildlife habitat. "We've got to start thinking of the floodplain as part of the river," Mitsch tells the teachers as they crowd onto the ramp. "We calculated 6 million gallons of water were here in the wetlands and not in somebody's basement during the January floods." The wetlands he is talking about stretch out before us: a 7-acre "billabong," an Australian term for the oxbow wetland that curves along the bordering Olentangy River, and a pair of kidney-shaped experimental marshes, each covering 2 1/2 acres. The kidney shape was a symbolic choice for Mitsch. Wetlands not only serve as a relief valve for floodwaters but also function as the river's "kidneys," filtering and cleansing the water that passes through them. Today the river is running high and fast, and the pumps that control water intake in these marshes are pulsing the water in quickly to mimic natural seasonal flooding. A drop of water now spends only two days in residence in the marshes instead of the usual three or four. "A lot of biology and chemistry goes on during that time," Mitsch tells us. "When water moves through the wetland and out more quickly, it doesn't have as much time for contact with the sediment, and soil-water exchange is very important for things like nitrate removal. So what we'll see in our samples is a smaller percentage of nitrate removed during the floods." Each year, though, these little marshes remove about 3,500 pounds of nitrogen and 27 tons of sediment from the Olentangy before returning its waters to the river on their journey to the gulf. The habitat value of wetlands is on active display around us as swallows dart low across the water and red-winged blackbirds flit about in the reeds. A muskrat cuts a V-shaped wake across the bil-labong as it swims. From the shaded upper deck of the pavilion, we can see a great blue heron stalking frogs and small green sunfish. What we cannot see, though, are the microscopic creatures in the ooze that perform most of the real work of water purification for which wetlands receive credit. Mitsch leads us to a footbridge over the Olentangy at the edge of the wetland complex, then downriver atop a 6-foot-high earthen levee. This levee was erected a century ago to keep what is now the experimental wetland from flooding and allow the land to be farmed. It also blocked periodic flooding of the bottomland hardwood forest that fringes the river. "These streamside forests that periodically flood were the most common natural wetlands in Ohio, and they can have trees that are up to 100 years old," Mitsch says, coming to a halt at a small channel cut through the levee. Chocolate-colored water is flowing through, and the trees beyond—all adapted to periodic "wet feet"—are standing in a foot of water. Four years earlier, Mitsch had convinced the state highway department—under legal requirement to atone for its destruction of wetlands on a road project—to cut four "notches" in this levee. "What we got was a quadruple bypass for this forest that restored its circulation and the integrity of its function," he tells us. The 13-acre forest is dry most of the time, but 4-10 times a year, floodwaters like these surge through the breaches, depositing vital nutrients that would otherwise be carried downstream. Like marshes, bottomland forests in the Mississippi basin disappeared rapidly during the past century, many as a result of federal flood-control projects. In 1937, half the Mississippi floodplain was forested. By 1977, less than one-fourth was forested, and clearing and draining continue even now.9 Since 1988, rampant destruction of wetlands in the United States has been dampened by a "no net loss" of wetlands policy and requirements to replace the acreage destroyed, but controversy continues about the effectiveness and enforcement of the policy. The very existence of the policy, however, does indicate how much society's view of the multiple values of wetlands has changed. Mitsch entered the field of ecology just in time to be swept up in that new appreciation of wetlands. Training in engineering and ecology left him with a hybrid mindset, Mitsch says. He retained the problem-solving, whole-systems outlook of an engineer, yet turned to the ecology of muck, microbes, and reeds to find solutions to problems that engineers would tackle with scrubbers, filters, and fossil fuel-driven processes. He has spent three decades developing a field Howard Odum initiated under the name "ecological engineering," a field committed to solving environmental problems by restoring the essential "bodily functions" of Mother Nature.11 Some of her most vital organs, of course, are wetlands. And it was his research on restoring and creating wetlands that got Mitsch involved with the problem of hypoxia in the Gulf of Mexico and led him and a handful of colleagues to advocate restoration on a massive scale. Clean water laws have spurred progress in some parts of the world in cleaning up obvious point sources of pollution such as industrial effluent pipes that discharge into lakes and rivers. But few nations have tackled the growing problem of pollutants such as manure and fertilizers that leak from the landscape. In the United States and most of the rest of the world, we still rely by default on aquatic systems to make these nonpoint contaminants "go away." Once the technical assessment was completed, a task force of federal, state, and tribal government agencies from throughout the Mississippi basin drew up an "action plan" for reducing and mitigating hypoxia in the gulf. The 2001 plan that resulted represents a compromise among many competing interests, from fishermen to powerful farm groups. The task force set a target of reducing the average extent of the dead zone to 2,000 square miles by 2015. To accomplish that, the plan assumes that nitrogen discharges to the gulf will need to be reduced by 30 percent. That reduction would be accomplished for the most part by a two-pronged strategy: reductions in nitrogen entering the river system and extensive restoration and creation of wetlands—mostly in the upper part of the basin—to trap nitrogen that does end up in the river.27 The upper basin states would thereby benefit as well as the gulf in this scheme. The U.S. Environmental Protection Agency considers at least 44 percent of rivers in the basin states to be "impaired"—with, for example, nitrate concentrations near or above the statutory maximum for drinking water (10 parts per million) and a history of pollution-related warnings about eating fish.28 Restored wetlands and better fertilizer management in the Midwest would not only improve water quality but also provide other values mentioned above: flood relief, wildlife habitat, and recreation. The enormous changes needed in farm practices, land use, and watershed restoration are to be accomplished by incentive-based voluntary actions in each region rather than by regulation. So far, the task force has done little to coordinate any basinwide efforts or secure new sources of funding. But that has not kept some state and regional groups and researchers from moving ahead. The assessment team Mitsch led, for instance, estimated in 1999 that nitrogen reaching the gulf could be reduced by as much as 40 percent through restoration and creation of an unprecedented 5-13 million acres of wetlands and 19 million acres of floodplain forests. The team also recommended creating more flood diversion structures in Louisiana so that flood-waters can be shunted through an extra 1-2.5 million acres of backwaters and wetlands in the Mississippi River delta before reaching the gulf.29 In the years since, Mitsch and assessment team colleague John Day, a professor of coastal ecology at Louisiana State University in Baton Rouge, have led a continuing effort to refine those numbers based on findings about the nitrogen-processing capacity of wetlands and their microbial inhabitants. The hallmark of wetlands, as their name implies, is that their soils are saturated or inundated with shallow water.30 As plant roots, microbes, and other respiring creatures draw oxygen from the sediments, they eventually use up the oxygen and thereby render the sediments anaerobic. Because of this, wetland soils support a wide range of anaerobic microbial processes such as fermentation, which produces alcohol and acetic acid, methanogenesis, which produces methane, sulfate reduction, which releases hydrogen sulfide, and denitrification, which releases nitrogen gas into the air. The microbes involved in these processes use creative ways to obtain energy as they dine on and decompose organic matter in the absence of oxygen. (Indeed, the metabolic versatility of microbes is one reason that "dead zones" and other extreme environments are never truly devoid of life.) The wide range of chemical expertise and appetites of microbes resident in wetlands is responsible for the cleansing power of these ecosystems. The nature and work of one group—the denitrifiers—are of particular importance, as the name implies, in coping with excess nitrogen. Nitrogen is an essential building block of organic molecules such as chlorophyll, DNA, proteins, and the enzymes that catalyze life processes. The air around us is 78 percent nitrogen and 21 percent oxygen, yet we cannot use the nitrogen we breathe the way we absorb oxygen. Few creatures can. That's because nitrogen molecules in the air are tightly paired into "di-nitrogen" or N2 form, rendering them inert and unavailable for use in metabolic reactions. 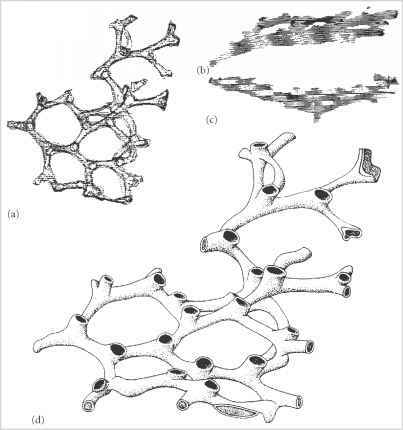 A few soil microbes, however, have developed the ability to split that bond and "fix" N2 into usable forms. Some symbiotic microbes can accomplish this energy-intensive task, including bacteria of the genus Rhizobium, which partner with the roots of legumes, and actinomycetes (bacteria that grow in threadlike form similar to that of fungal hyphae) in the genus Frankia, which team up with a variety of other plants. Some free-living microbes such as cyanobacteria and cyst-forming Azotobacter also fix nitrogen. That was it until 1913, when an industrial nitrogen-fixing process known as Haber-Bosch was invented and humans began to pull ever increasing amounts of reactive nitrogen from the air. The first use of this new process was to increase supplies of nitrate for manufacturing military explosives, but since the 1950s, most of the reactive nitrogen produced has gone into making synthetic fertilizers. Once biologically reactive nitrogen is put into play, an array of microbes determines its fate. Some microbes break down organic forms such as the amino acids in proteins and the nucleic acids in DNA to yield ammonia; nitrifying bacteria convert ammonia to the more plant-usable form nitrate; ammonifiers reverse the process, converting nitrate to ammonia; and denitrifiers convert nitrate back to gaseous forms—mostly to inert N2 but some fraction is converted to nitrous oxide (N2O), a culprit in global warming, destruction of the stratospheric ozone layer, smog formation, and acid rain.31 Only when some stages in this complex, interrelated set of nitrogen transformations are reduced or overwhelmed do we notice—such as when excess nitrate pours into the gulf and causes hypoxia. For those interested simply in the large-scale cleansing capacities of wetlands, denitrification is a black-box process to be measured in terms of how much nitrogen flows into and out of a system. Few are familiar with the identity, preferences, and capabilities of the one-celled creatures that actually do the work. To learn a bit about these creatures, I turned to James M. Tiedje, director of the Center for Microbial Ecology at Michigan State University, who has long studied the ecology of denitrifying bacteria and how denitrification is regulated in nature. The first thing I learned is that denitrification is a job that a very broad array of microbes can handle, and so denitrifiers are probably ubiquitous in soil. "It's easier to say which kinds of groups don't have denitrifiers among them," Tiedje told me when I asked for some examples. That would include gut-dwelling organisms such as Escherichia coli (E. coli) and also groups like fermenters and methanogens that must operate without oxygen. "But among most other major physiologic groups, there are some denitrifiers," he added. Even certain nitrogen-fixing bacteria can undo their work by denitrification. "Probably most of the denitrification in soils would be carried out by some of the most common, rapidly growing soil organisms, like Pseudomonas." Pseudomonas is a large and versatile genus whose members engage in a wide range of activities including decay and nutrient cycling, promoting plant growth and disease resistance, or causing disease among plants, animals, and humans. Many pseudomonads are also nutritional opportunists, known for getting their carbon by eating toxic pollutants such as fuel oil. And some pseudomonads can also denitrify nitrate when they must. I say "when they must" because it turns out that no microbe lives the life of a denitrifier when it has a choice. Virtually all denitrifiers prefer to respire using oxygen just like we do, Tiedje explained. But when oxygen becomes scarce, denitrifiers can feed on nitrate to obtain the oxygen molecules they need to "burn" (respire) carbon during metabolism. They then exhale nitrogen gas as a waste product. Soil bacteria can find themselves forced to make do without oxygen not only in the flooded soils of wetlands or ocean sediments but also within tiny soil aggregates almost anywhere from forests and crop fields to compost heaps. Denitrification is a second-choice lifestyle because the payoff is meager compared to breathing oxygen. "The energy yield from de-nitrification compared to respiration with oxygen is about two-thirds," Tiedje told me. "So that's why it's to the organisms' benefit to always use oxygen when they can, because they make one-third more cells." There are several oxygen-containing (oxidized) inorganic compounds besides nitrate that can be respired, including sulfate, ferric iron, and some chlorinated compounds. "They all yield different amounts of energy, and nitrate is one of the best," he said. "So if you can't do oxygen but you can do nitrate, you usually have a competitive advantage over everybody else." And all of the alternative ways of respiring are more efficient than having to ferment organic compounds such as glucose to get energy. Do different types of microbes handle the same job differently, and does it matter? This is a hot topic of research right now, for denitrification and other microbial processes. Some bacteria, for instance, might be particularly good at denitrifying in the presence of extremely low levels of nitrate. Others might produce and release the undesirable byproduct nitrous oxide more readily. One difficulty in probing such questions has been identifying just who is doing the work. For example, pseudomonads—or what researchers thought were pseudomonads—have been used extensively in research on the biochemistry of denitrification. "Twenty years ago, Pseudomonas as a genus was huge," Tiedje recounted. "Then beginning in the 1990s, it was split into primarily five other genera." Even to a non-taxonomist, that indicates these bacteria may not be such close neighbors on the family tree. It also means that some of the activity that was attributed to pseudomonads in various experiments was actually the work of other genera of denitrifiers. Even with molecular techniques available, researchers are finding it difficult to parse microbes into what biologists dealing with larger life forms call "species." The entire genetic blueprints for 150 microbes have been decoded, for instance, including complete genomes of nine strains of the species E. coli. Yet only about one-third of the E. coli genes are common to all nine. "That's a lot of functional diversity that can occur in what is currently considered a single species," Tiedje pointed out. "Generally, what we want to use the species concept for is to be somewhat predictive of what an organism is capable of doing. So the current species definition is too liberal." Many people dealing with the ecology of microbial processes simply ignore species and stick to the black-box level, but Tiedje thinks it's time for a change. "I'm of the opinion that we've looked at these general processes for 30 years and now we need to know more about the organisms underlying those processes, the catalysts," he said. That's especially true for microbes that could be harnessed to clean up environmental pollutants. Finding a low-concentration specialist that eats benzene, for instance, is important when you want to clean up the last bit of benzene residue in drinking water. Some organisms that eat benzene, toluene, and other serious contaminants in gasoline are also capable of respiring nitrate, Tiedje noted, a combination of talents that could be put to work cleaning up oxygenless underground pollution sites. For removing dissolved nitrate in wetlands, however, Tiedje believes the diversity of organisms involved and their wide distribution make it reasonable to ignore the particular identity of the microscopic players and manage the process with whatever microbes are present. Studies by Tiedje and other researchers have identified a number of environmental conditions that affect the overall rate and efficiency of the denitrification process—probably by influencing the performance of various organisms and the structure of the microbial community in ways scientists haven't yet deciphered. Warmer waters, low salinity, and plenty of edible carbon boost denitrification, for instance. Heavy metals such as cadmium, copper, and zinc can inhibit it. Fast movement of water through a wetlands system reduces the percentage of nitrate that can be removed. Research on understanding the process continues. Even as Mitsch and I sit in his conference room talking, we can see that one of his students has donned knee-high rubber boots and sloshed out into the flooded margins of the marsh to draw air samples that will eventually tell her whether more nitrogen is being released to the air from permanently flooded sediments or from soils that are intermittently wet and dry. A fundamental tenet of ecological engineering is whenever possible to rely upon the "self-designing capability of ecosystems and nature. "32 Thus Mitsch sees little need to manipulate the plants, much less the microbial community, in most created wetlands, as long as designers get the water circulation right and are willing to be patient.33 Patience is sometimes needed for decades, not the 5-year time frame by which most constructed wetlands are judged a success or—more often—a failure. His is a "build it and they will come" approach that not all ecologists agree with, to be sure.34 Indeed, federal regulations for constructing replacement wetlands often specify which plants must be present in what proportions. But unless the goal is to restore habitat for a specific plant or animal, Mitsch believes that's unnecessary. "Get the hydrology right and you'll get an abundance of diversity coming in out of the river," he says. Bacteria, algae, insects, fish, and plant propagules of all sorts will wash in. Seeds will arrive on the wind. And Mother Nature will choose what survives. "I think you can tell after a couple years whether you've got the water right, and if you get that right, Mother Nature will be very, very forgiving and eventually it will develop into a very nice wetland," he tells me as we sit looking out on the marshes. "I just believe that. It will go through some pains. It'll have cattails invading, muskrats coming in. But I think in the long run, if it's a sustainable hydrologic situation, then you're well on your way to being successful." The fate of these decade-old wetlands has implications for the gulf because the scale of restoration Mitsch and his colleagues believe is needed in the Mississippi River basin will preclude micromanagement. Further, these wetlands experiments are not only testing ideas about self-organization but also helping the researchers fine-tune their recommendations about the extent of new wetlands that will be required to staunch the bleeding of nitrogen from the heartland to the gulf. To refine these estimates, Mitsch and John Day of Louisiana State have continued to collect information on the amount of nitrogen removed per acre in a wide variety of wetland types, from the little Olentangy research marshes to the gigantic Caernarvon diversion system south of New Orleans, which since 1991 has been channeling water from the Mississippi main stem into a 100-square-mile wetland as part of an effort to restore deteriorating marshes in the delta.41 Although the nitrogen-trapping performance of any given wetland varies over time—with the seasons, with changes in nitrate levels in the river, and with a host of other environmental factors—the team has now accumulated a combination of 40 years of data from a variety of marshes in Ohio, Illinois, and Louisiana. A dozen years of monitoring here at Olentangy, for instance, show that on average the experimental marshes pull 498 pounds of nitrate per acre from the water each year. Louisiana's Caernarvon wetland performed at a slightly higher average rate over 12 years of sampling, with each acre of marsh removing 586 pounds of nitrate from Mississippi River water. It's also a bigger number than you'd get from an environmental engineer (formerly called a sanitary engineer) constructing wetlands for tertiary treatment of wastewater (the nutrient removal stage) from municipal sewage plants, a wetland service that has been well studied since Howard Odum's pioneering work.43 "We're the only ones coming up with these gigantic numbers for wetlands that would have to be restored," Mitsch tells me. "People who design wetland waste treatment systems will tell you they can remove five or six times more nitrogen per acre than we're getting, and they can. But treatment marshes built as part of a sewage plant are not meant to be sustainable, and they inevitably become cattail marshes. We're talking about building wetlands that are functional, sustainable, have some biodiversity and all the other values that wetlands can provide. We don't want single-purpose systems, especially up here in the upper Midwest just to benefit the gulf." It's an example of the fact that trying to maximize a single ecological service, whether water purification or crop and timber production, often creates "disservices" in other ecological functions. The 5.4-million-acre figure of new wetlands needed to reduce by 40 percent the nitrogen entering the gulf does not include bottomland forests because these usually remove less nitrogen per acre than marshes and backwater wetlands.46 But Mitsch and others would like to see a major restoration effort for these habitats, too. "We should have a policy of not plowing up to the edge of a stream," he explains. "We need this riparian zone to serve as a buffer, shade the stream, provide a bit of a relief valve for floodwaters." As for the restored and created wetlands, they should be strategically located in two different parts of the landscape, he says. One would be right alongside rivers where wetlands such as the Olentangy or the Caernarvon marshes divert and cleanse part of the flow before returning it to the river or gulf. Such diversion wetlands would capture and cleanse the spring flood pulses that usually carry large amounts of newly applied fertilizers swept off the land by rains. The second location for new wetlands should be right on the farms themselves, intercepting nitrates as they're coming off the fields or out of field drainage systems. "The advantage of these is the nitrate concentrations are much higher the closer you get to the corn plant," Mitsch points out. "Therefore these wetlands can be more effective at nitrate removal, but on a smaller scale." A much larger wetland area is required to remove the same amount of nitrate once it is diluted in the river. All of these trends emphasize the urgency of preserving and expanding the wetland habitat of the microscopic sediment creatures that help to remedy the ills created by our overfertilized civilization. And it confirms the folly of ignoring the power of vast numbers of little things underground.